This morning at around 5am I woke up to watch Germany v Italy. I was curious to see where the election results stood at the time. Curiously, everyone seems to be reporting different results. The Australian Electoral Commission Tally Room reports a pending Labor lead of 71-67 (It was 72 to Labor this morning); whereas the major newspapers have reported something in the order of a 69-65 or a 68-66 lead for the Coalition/Liberal. So my question is: how come no one, apart from various posters/commentators on the internet, seems to have pointed this out? It seems pretty strange to me. Could the differing results have anything to do with the way in which the numbers are interpreted, for example, the way in which preferences are predicted to flow to certain candidates? 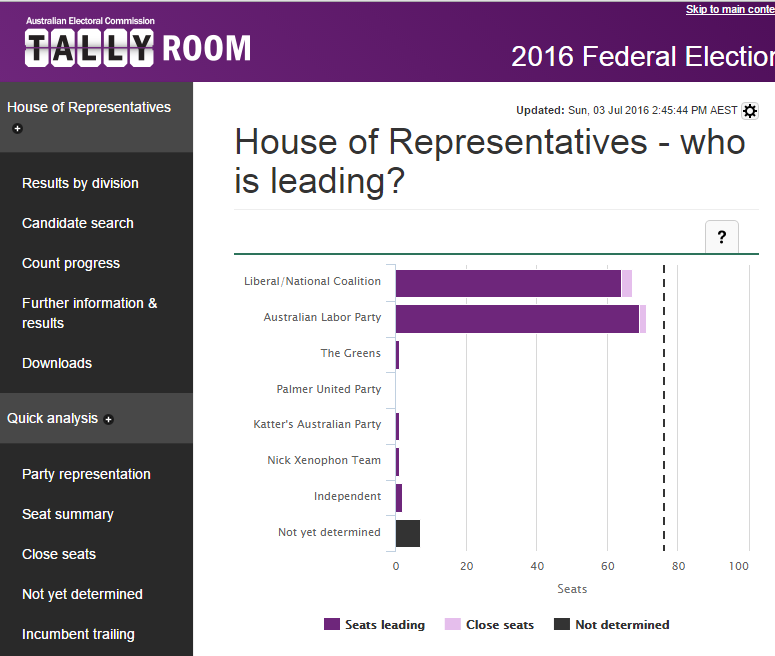 If so, then what is the point of the AEC Tally Room?! Not that I am too concerned - politics is not really my thing. But I do certainly take a general interest in many things - obviously this is a big thing, a country's election result. "What's the deal with no counting today or tomorrow? In a country looking for stability it seems very strange to leave everything in suspense like this. 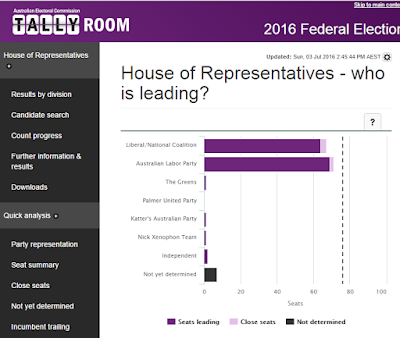 Can the AEC really not gear up once every 3 years (federally at least) to work through until a result is known? The next 2 days are going to be unbearable as the media and politicians over-analyse the same sets of numbers with no new information. Can't wait to see what the markets do on Monday with no counting and an undecided election." "No, it's because a box of votes was stolen last election. What happens now is they are tracked and come to a central location for counting under scrutiny. The votes will all be there by Tuesday for counting."